Willy Bitter, CEO and founder of Willy's Mexicana Grill, has opened a 24th Atlanta-area outpost that boasts a patio for al fresco dining. The menu includes fresh-made California-style burritos, quesadillas, tacos, nachos and salads and a salsa bar. Known for its reliance on fresh ingredients, Willy's makes its guacamole and salsas twice a day. Vegetarian options are available, too. For dessert, looks for an array of Atlanta-founded King of Pops. Eventually, beer will be offered at this location. Lunch & Dinner daily. Willy's Mexicana Grill, Sandy Springs Plaza, 6309 Roswell Rd., Sandy Springs, GA 30328, 470-355-9596. Another venture from Legacy Restaurant Partners, Twin Smokers Barbecue & Bourbon will open Saturday, December 27, 2014, in downtown Atlanta's Luckie Marietta District. The restaurant's name, “Twin Smokers,” refers to its two custom red Oyler 700 smokers: one for chicken and pork and the other for beef. The restaurant also boasts its own “wood library” for the mesquite and post oak (for beef) and hickory and white oak (for chicken and pork). The 4,000-square-foot restaurant will be helmed by executive chef Chris Blobaum (Bone’s, OK Café, Blue Ridge Grill). Lunch & Dinner daily. Twin Smokers Barbecue & Bourbon, 300 Marietta Bldg., 300 Marietta St. NW, Atlanta, GA 30313, 404-698-4707. STATS, a popular downtown sports bar and restaurant, experienced a small hood fire and has closed for repairs and to correct any conditions that might have caused the event. STATS should reopen in the near future. Stay tuned. STATS, 300 Marietta St. NW, Atlanta, GA 30313, 404-885-1472. Founding chef David Bradley has departed Lure, leaving a new opportunity for Brent Banda, formerly the executive chef at La Tavola Trattoria. Incoming in Banda's place at La Tavola Trattoria will be Justin Jordan, current sous chef at Lure. Banda has long been with Fifth Group Restaurants, beginning with his work at The Food Studio. Bradley's new post will be as chef and nutrition director for the Atlanta Neighborhood Charter School. Lure, 1106 Crescent Ave. NE, Atlanta, GA 30309, 404-817-3650. When Joe Schafer departed King + Duke, it was certain he would turn up somewhere significant in Atlanta. Now that's known: it's Abattoir. When Hector Santiago took over there as executive chef, it was equally certain that would be a finite post, as Santiago surely would want another restaurant of his own. And now he's signed a letter of intent to open a restaurant in the Ponce City Market. The pair will work together until Santiago departs, giving Schafer time to get to know the team and to envision how he might put his stamp on some of the restaurant's fare. This change may result in the loss of some of the Latin-inspired flavors that had become popular under Santiago's governance, but we look forward to what Schafer may produce as his own mark. The transition gives Abattoir an executive chef with first-rate grilling skills and turns Santiago loose again to create something uniquely his. Atlanta wins all around. Abattoir, White Provision Building, 1170 Howell Mill Rd. NW, Atlanta, GA 30318, 404-892-3335. Joe Schafer left his post as executive chef at King + Duke for reasons that chef/owner Ford Fry announced as "personal." In his place, overall company executive chef Drew Belline, also the chef at No 246 Restaurant in Decatur, has been overseeing the operation, but now a replacement has been named within the company's structure. Formerly at Woodfire Grill and most recently executive chef at JCT. Kitchen & Bar, one of Ford Fry's other restaurants, E.J. Hodgkinson has been named King + Duke executive chef. 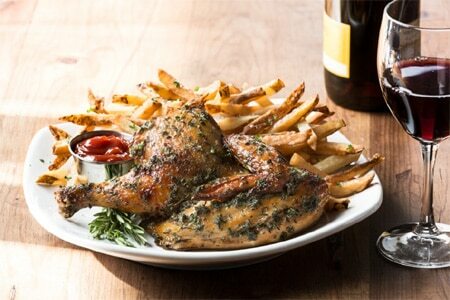 Hodgkinson, a native of California, figures to lighten up the food at King + Duke. Called Rocket Farm Restaurants, Fry's organization soon will tally eight establishments with the imminent opening of two new ventures, one in Avalon in Alpharetta and another at the Krog Street Market. King + Duke, One Buckhead Plaza, 3060 Peachtree Rd. NW, Atlanta, GA 30305, 404-477-3500. Founded in 1952, the Old Hickory House in Dunwoody has closed, leaving only the location in Northlake (2202 Northlake Pkwy., Tucker, 770-939-8621). At one time there were numerous Old Hickory House outposts all over the Atlanta area, including Buckhead and Ansley. But that number had dwindled to two, and now only one remains standing. Old Hickory House, Shoppes of Dunwoody, 5590 Chamblee-Dunwoody Rd., Atlanta, GA 30338, no phone. Anticipating a fast renovation, Burnt Fork BBQ has closed for its long-planned updating and expects to reopen in September. Fans of its succulent brisket, pulled pork and chicken will wait patiently for its re-launch. The place is known for its from-scratch cooking and attention to detail, even making its own ketchup. Burnt Fork BBQ, 614 Church St., Decatur, GA 30030, 404-373-7155.